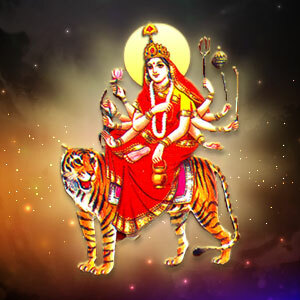 Kushmanda puja is performed for attaining wealth, health and inner strength. On this fourth day of Navratri, devotees install and worship the Kalash and then offer their prayers to the Goddess. Using a green colored asana while performing this Puja is considered auspicious. Offer Water and Flowers to Mata Kushmanda seeking blessings for the good health of self and dear ones. If someone in your home is terminally ill, then seek special blessings from Mata for his/her early recovery. Offer bhog or fruits to Mata Kushmanda as per your capacity. Talk to astrologers on Toll Free 1800-102-1848.